Alpine Walks offer bespoke trekking holidays for individuals and groups across the European Alps, Italian Dolomites and the Abruzzi region of Italy. We offer self guided and guided walks with a range of accommodation and destination options. Alpine trekking holidays with a difference. Hi, I’m Duncan. Apart from running Alpine Walks, my interests include World War 2 history and mountain wildlife. I continue to develop trips involving these two things that I enjoy. I’ve spent the past year learning all about working with donkeys. My first trip was to a charity called, ‘The Donkey Sanctuary’, in Sidmouth, Devon. Then it was out to the Alps to learn about pack saddling and safe movement in the mountains. And so now with the assistance of my new friends, I can offer a range of exciting walking breaks to individuals and groups looking for a holiday with a difference. Outside of the main trekking season, I continue to trek with my donkeys on other journeys. Please visit our blog for the latest news. 1984-96 Founder, Duncan Boar, served in the Royal Air Force, becoming an adventure training ‘Unit Expedition Leader and also passing the RAF Mountain Rescue Team selection course. After leaving the RAF he was offered the position as a leader on the 1996 British Schools Exploring Society Expedition to Namibia. He spent 6 weeks living in the Namib desert teaching students desert navigation and expedition skills. In 1998 he bought a book about Alpine climbing, took off to the Chamonix valley and with little prior experience successfully summited Mont Blanc, with two friends. Between 2004 and 2010 he worked as an expedition leader in Ecuador, Peru, Bolivia, Chile, Morocco, Malawi, Romania and India, before qualifying as an International Mountain Leader and moving to Italy. 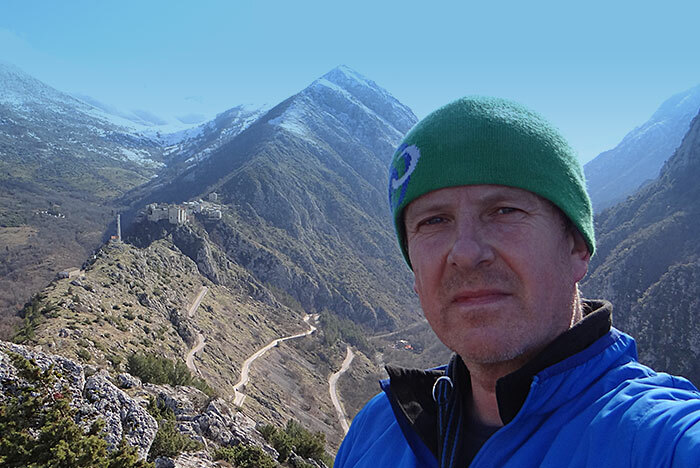 During 2011- 2017, Duncan guided many routes in the Italian Dolomites, Italian/French/Swiss Alps and Spain’s Sierra Nevada’s and Picos mountains. 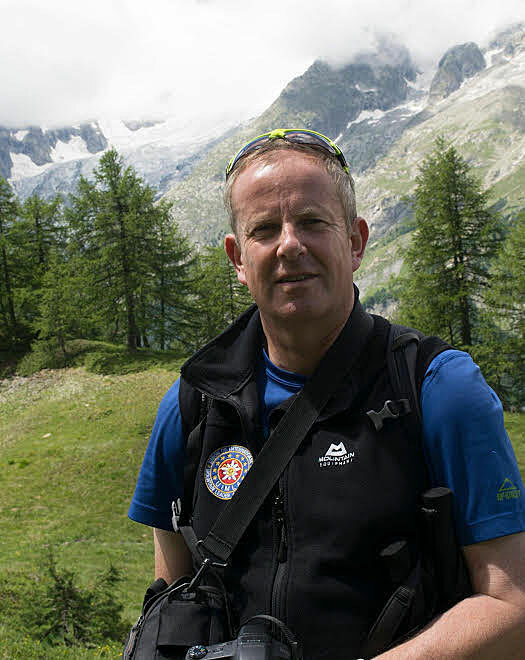 In 2017, after recovering from injuries received in military service and supported by Help 4 Heroes and X Forces, Duncan set up ‘Alpine Walks’. As a result, we now offer some of the classic trekking routes such as the ‘Tour du Mont Blanc’. We focus on Italian and French Alps holidays with the inclusion of ‘Alpine Life’. All our Italian and French Alps holiday experiences are based on local knowledge of the regions we trek. All our guides are qualified International Mountain Leaders with experience of the routes they guide. Alpine Walks is currently the only British company offering guided treks with donkeys on the Tour du Mont Blanc. 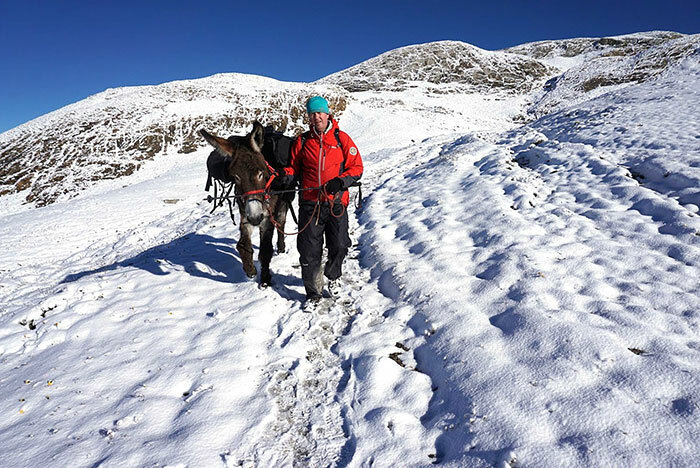 Donkey walking trips are only guided by the company founder, Duncan Boar, so you'll be getting the full experience of helping to care for the donkeys as part of the experience. If you are passionate about WWII history, then our 'Freedom Trails' are ideal and take you on a journey into the past. The trails you'll walk are the same ones used 75 years ago. Don't worry though, we won't accommodate you in a barn! We like to look after our clients! As well as getting a full kit list, you'll receive input on the advantages of using trekking poles and ways to alter your posture on different mountain terrain. These journeys require stamina and our aim is to complete each day at a comfortable pace, so that you wake the next morning fit to continue! If you are booking one of our 'self guided walks' then you can be safe in the knowledge that the same tips from our fully guided walks will be available to you via video clips when you book your walk. If you want to brush up on your navigation before a self guided trip, then we offer some competitively priced ‘navigation training days’ in the UK, prior to the summer trekking season. Contact us for more information. The Union of International Mountain Leader Associations, of which the British Association of International Mountain Leaders is a part, train and assess people for the qualification of International Mountain Leader (IML) against the challenging requirements of the UIMLA. These requirements are specified in a document called “A common platform standard”. The IML qualification lets the holder lead groups in different mountains all over the world, where the skills of alpinism are not required. IML’s can provide tours on glaciers and permanent snow, and where the planned use of a rope is not necessary. IML’s also work with groups on high altitude treks as well as lead groups on snow shoes. IML’s, from every member country, have to maintain International Continuing Professional Development (ICPD) to ensure that members are kept up-to-date with the latest developments in mountain leadership. Only qualified International Mountain Leader has the badge and the carnet of The UIMLA organization. What types of walking breaks do you offer?